Many happy new parents find themselves with an unexpected dilemma: what to do with unused embryos. There are several options but state law may limit them. Your fertility specialist is well-versed on the local laws governing all aspects of assisted reproduction and can answer many questions. A mental health or family counselor can help with the emotional aspect of the decision. Turn to spiritual advisors if ethical, moral, or religious questions accompany the decision. Shared life experiences draw people together. Infertility is one of those experiences. If you’ve befriended someone still struggling with infertility, consider donating your unused embryos to her. Family members struggling with infertility issues may be especially welcoming of an embryo that keeps genetics all in the family. Similar to directed embryo donation, anonymous donation allows a stranger to use the embryos you no longer need. It’s possible the donor couple will never know the child born of their DNA but this is a generous way to share unused embryos when you do not care to know the child’s identity. 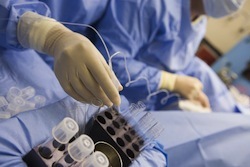 Advances in infertility treatments rely on the materials needed to conduct research, including embryos. Donating embryos to scientific research in infertility means your embryo won’t produce just one child for one family but could enable many children to be born to many families for years to come. If religious, moral, or ethical concerns cause pause, schedule a consultation with a priest, clergyman, or other trusted spiritual mentor before making this decision. Frozen embryos can be thawed and then disposed of in medically sound ways. Sometimes this decision is made easier after consultation with a trusted advisor. Embryos can be kept in storage for years but unexpected life events might leave the decision to someone else. In case of divorce, incapacitating illness, accident, or death, the embryos still need to be considered. If the plan is to keep them in storage for an extended length of time, appoint a family member to act in your stead if you cannot. Discuss options and devise a plan before the unexpected happens. If there’s any possibility at all that another child may be desired in the future, continue storage until the possibility is no longer an issue. It’s easier to donate later than live with the regret of a final decision made too soon. Source: "What Are My Options If I Decide Not To Use My Stored Embryos?" American Society for Reproductive Medicine (ASRM). Web. Retrieved 13 Nov 2013.